Hola from oh-so-steamy Yuma, Arizona! First, I would like to thank you all for your lovely, heartfelt comments on last week’s confessions post. I want to kiss all your faces and tell you over and over how much I adore every one of you. You make my heart melt. 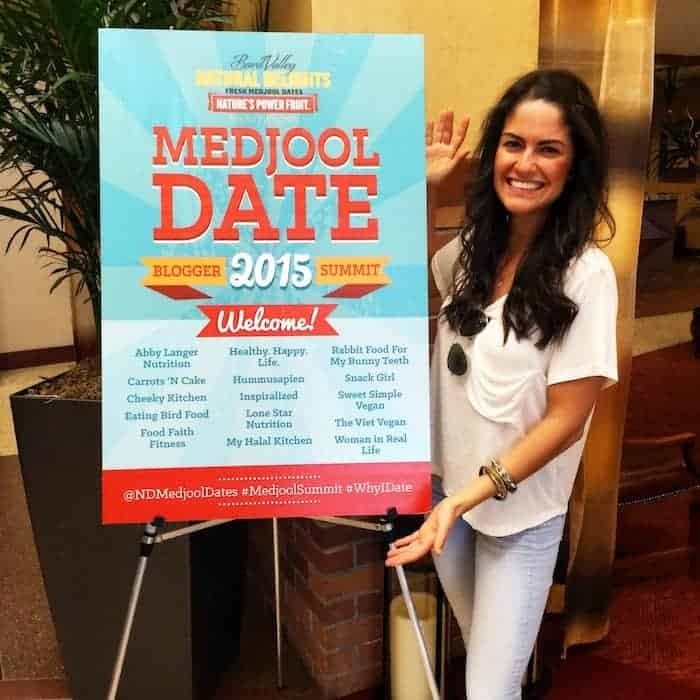 I’m in this lovely little historical town thanks to the 2015 Natural Delights Medjool Date Blogger Summit! You all know about my love affair with dates. I use them to sweeten pretty much EVERYTHING. So you can imagine how excited I am to shimmy my way up the tree, pluck off a fresh Medjool date, and shove it in my face. Literally I nearly die just thinking about it. I’m [hashtag] blessed to be here with a group of crazy talented bloggers that I’m sure you all know and love. Be sure to follow along on Instagram! Today is basically a super long day of eating. Since Columbus is three hours behind Arizona, I had already eaten breakfast and lunch by the time my flight landed at 8:45am Arizona time. It’s a tad confusing, but I look at it as an excuse to eat more food, naturally. Pre-flight fuel was my typical blueberry cacao smoothie, which is this recipe with more almond milk so I can drink it. Since I left my apartment at 6am and knew I wouldn’t arrive in Yuma until (I had a layover in Pheonix) til the afternoon, I wanted to be armed with food. Airport food is not my friend and I hate being hungry at hotels in between meals. 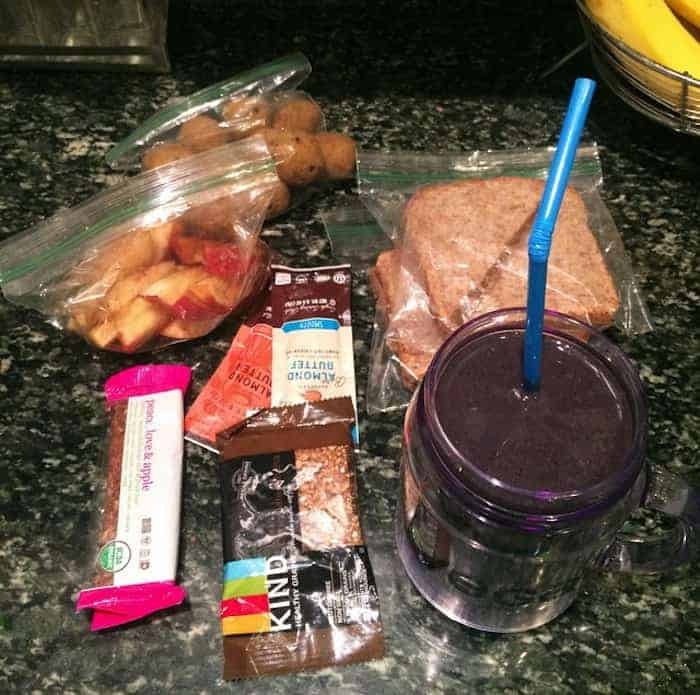 I packed two almond butter and jelly sandwiches on Ezekiel sprouted bread, nut butter packs, a sliced apple with cinnamon, a bag of pumpkin pie no-bakes (recipe coming next week, adapted from this recipe), a KIND granola bar, and a Ginny Bakes bar. 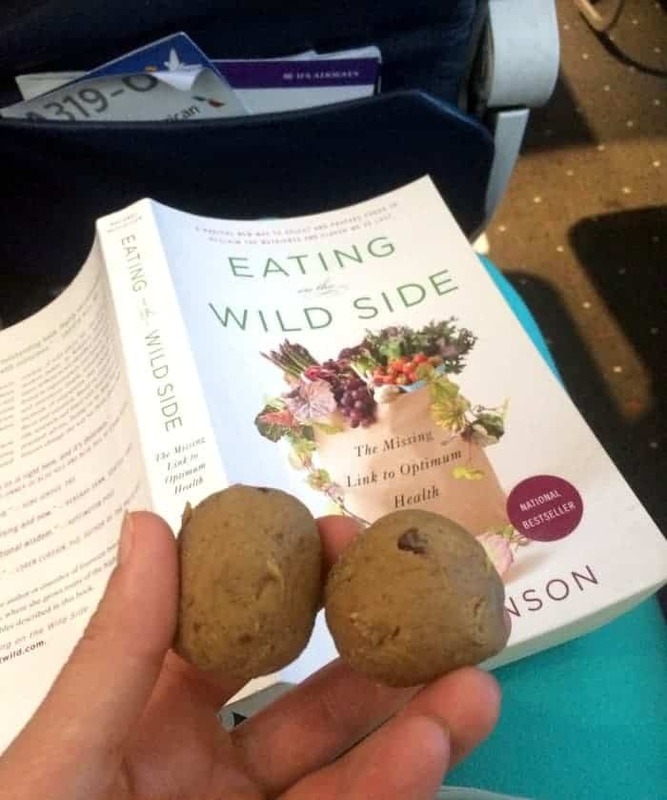 During the first flight I ate a couple no-bakes. I was gifted Eating on the Wild Side by The Wild Blueberry Association on my last trip, and I absolutely love it. I’m learning some pretty crazy facts about our current food system and how our modern day fruits and veggies differ both in taste and nutrition from those of the past. You should all read it! 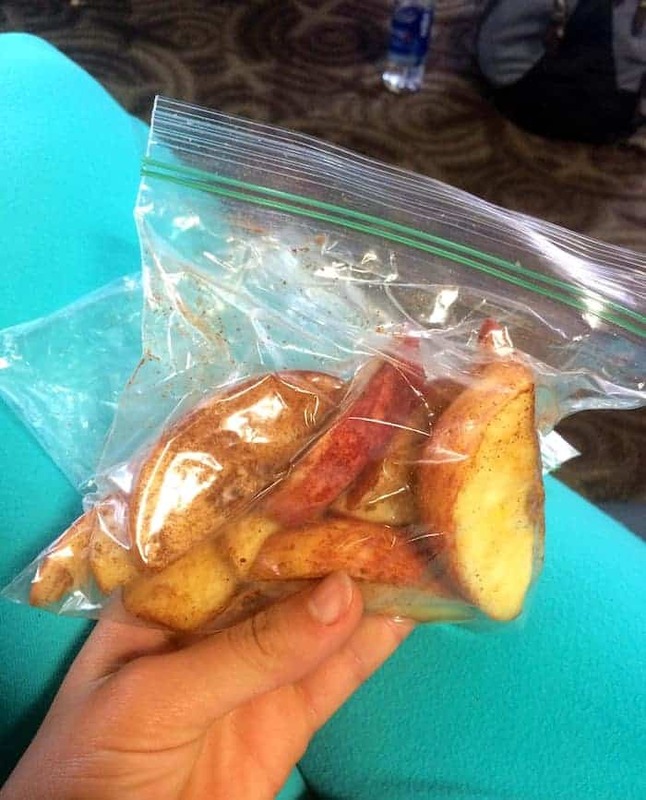 It was around lunch time (on Columbus time) when I got on my second flight, so I ate an AB&J and the apples. Side note: have you had enough of my bright blue pants yet? They’re my obsession if you couldn’t tell. The ultimate comfy and cute yoga pants. They’re Beyond Yoga capri leggings and I got them on sale at Barre3Columbus. I wouldn’t hate having them in every color of the rainbow. 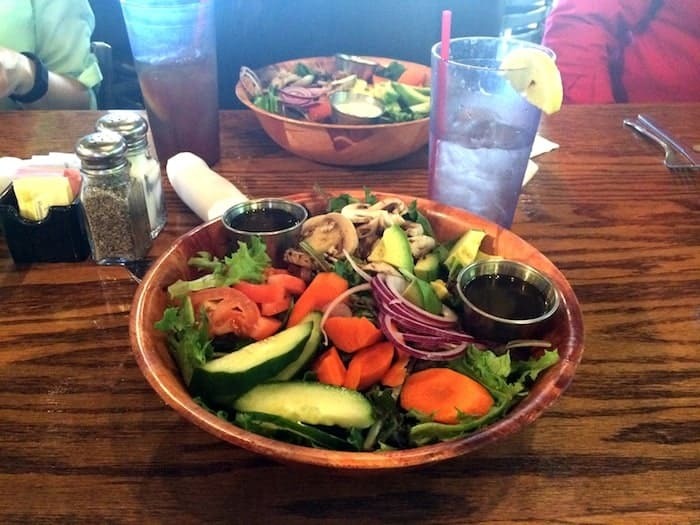 When we arrived, the lovely folks at Natural Delights took us to a local spot for lunch. I wasn’t my normal famished self since I technically already ate, but I got a big house salad with extra avocado because let’s be honest, I can always eat. I also had some of the hummus that was ordered for the table. Before dinner, we had a cocktail reception at the hotel. 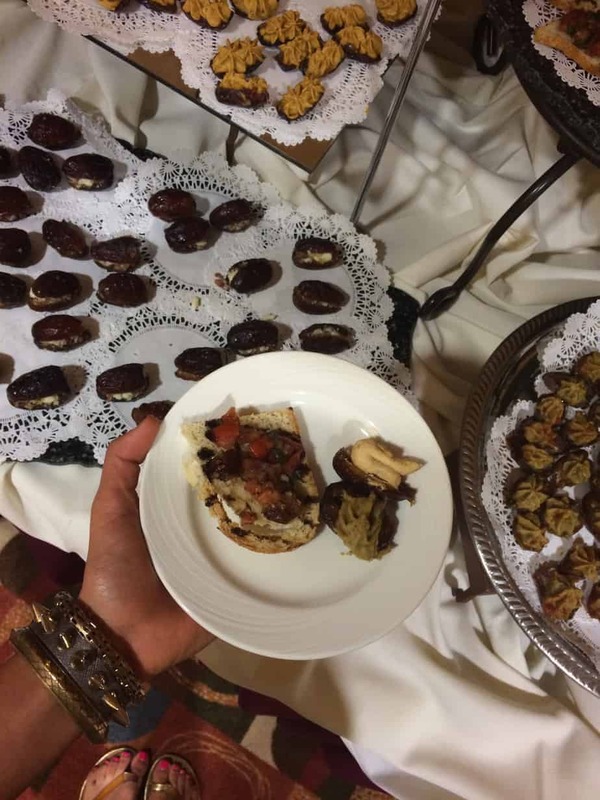 I snacked on a few pretty amazing appetizers, including peanut butter stuffed dates, pumpkin spice stuffed dates, and a tomato date bruschetta. Believe me when I say I could have eaten the entire tray of peanut butter dates. Ok and maybe the pumpkin ones, too. Dinner was at one of the grower’s lovely homes. It started with more wine and even more appetizers (endive leaves with mango salsa, tomatoes, mango, avocado red onion + walnut and Medjool date tapenade and crackers). 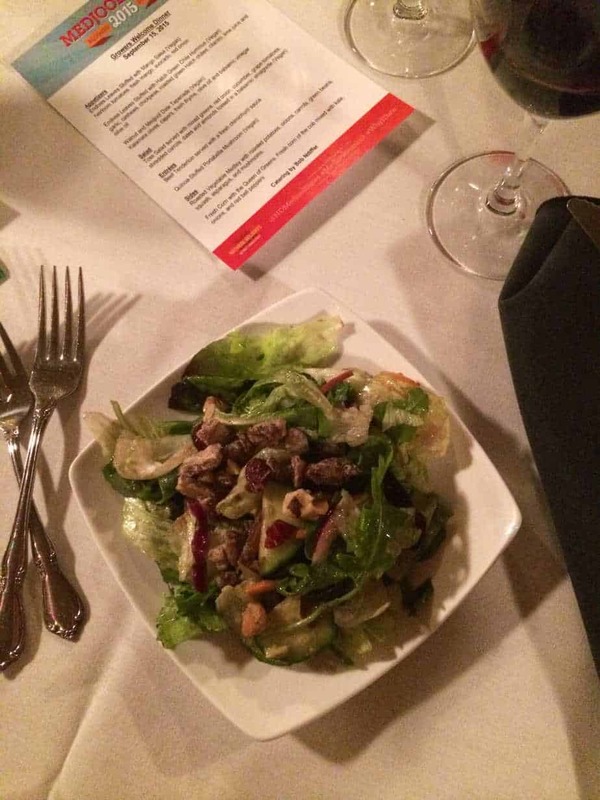 My favorite dish of the night was actually the salad, which had mixed greens, red onion, cucumber, tomatoes, carrot, dates, and almonds tossed in a balsamic vinaigrette. 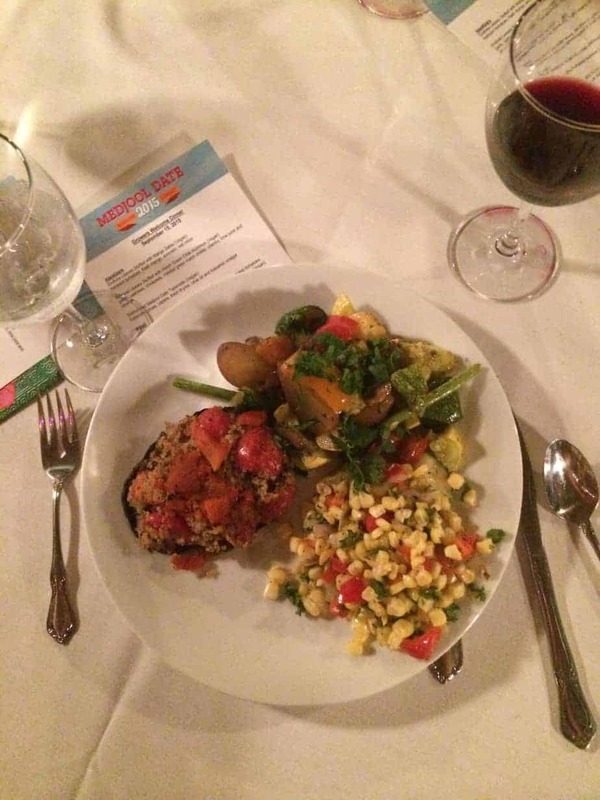 The vegetarian option for the main course was a tasty quinoa-stuffed portable mushroom with roasted veggies and a corn salad. I was very impressed with the veggie variety. Please forgive the atrociously blurry photo below. It was clearly past my bedtime. 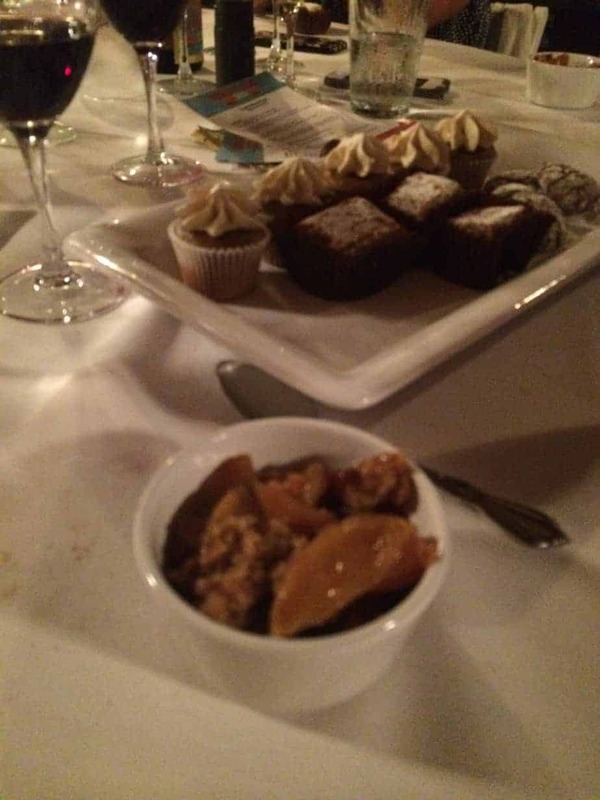 I was epically full by the time the desserts came around, but I still have some apple date cake and a taste of the chocolate crinkle cookies. Because…chocolate. There was even a chocolate covered date left on the bed when I arrived back at the hotel! Too cute. I would normally give more description on all the incredible food but it’s safe to say that I’m beyond exhausted and beyond full at this moment. So cha cha for now, hummus homefries! 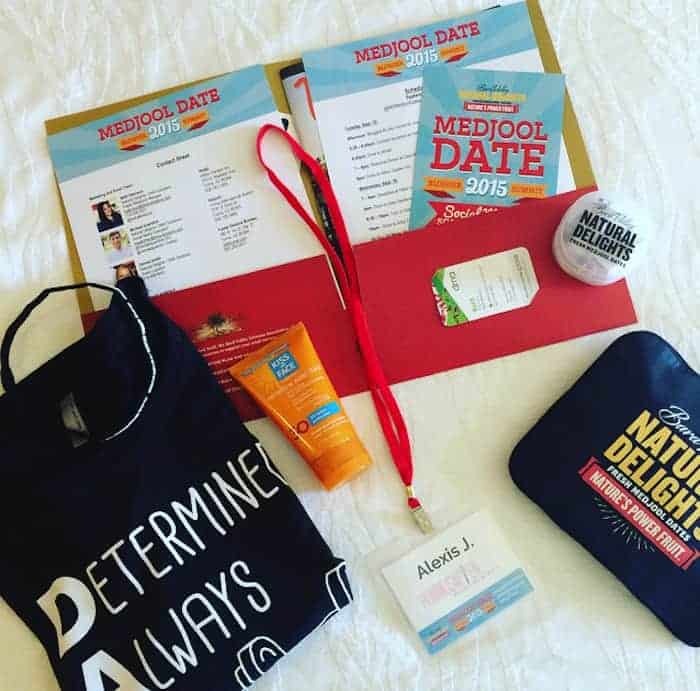 I actually had a surplus of dates to use up over the weekend and I hopped on to your blog because I remembered how much you use dates in everything! Made some of your bites, including the lemon coconut ones which were delish! How fun! I can’t wait to hear more about the trip. And that book sounds great! I’ve been reading so many books on that topic but you can never have enough ;) Enjoy Arizona! As always, great to see the variety of great foods you eat. Have a fantastic time on the trip! This goose doesn’t know what a laundry is supposed to do. Call me a goose one more time. They were INSANE. I could have eaten like thirty seven. Yesssss dates on salad are everything! So good with almonds and avocado. hope you are enjoying your trip!! Thanks lady! Sad its’ over! Love those pants! They make me happy with the bright color! That event looks like a blast! Mejdool dates are the shiz. I follow almost every blogger there on social media and I saw a pic of the menu at some point and thought all of the veg options sounded amazing! Thanks lady! I’ve been all about the fun pants lately. I need to stop shopping…eeeek! ed the Catalac of dates; very rich and yummy! You are probably going to turn into a date at the end of this trip! Everything looks and sound delicious! If I turned into a date I may have eaten myself…oh dear. SO MUCH GOODNESS. Random question- where is your white tshirt from in the top photo?? Love it! It’s from Pac Sun! So random, but they have awesome basics :) I think they’re on sale right now! So many dates!! I love it. Thanks for sharing the goodness from your trip. All of those dates look DELICIOUS! Also, a chocolate covered date? I would be in heaven. I’m still dreaming about it! It was seriously one of the best things I ever ate. The dreamiest. I went to this Pure Barre at the Farm event and there were “bites” by Hummusapien. Is the recipe on here? They were so good. 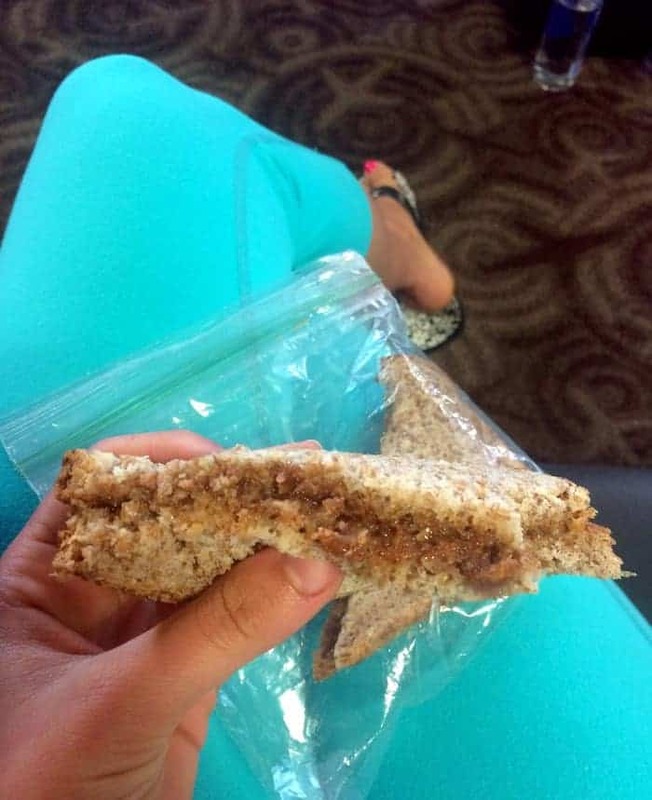 PB with craisins? I would love to have them again! !